Research on REDD+, or Reducing Emissions from Deforestation and Forest Degradation, plays a big role in the CGIAR Research Program on Forests, Trees and Agroforestry (FTA). In this blog, Barbara Fraser takes a look at the struggles of indigenous communities in Peru who want to protect their forest and found that they view REDD+ positive, but are more focused on their concerns in every day life. For Carolina Barbarán, leader of an indigenous Shipibo Konibo community near the Ucayali River, protecting local forests is a major concern – because here, in the heart of the Peruvian Amazon, the future of forests is the future of the people. “A big threat comes from illegal loggers who steal our timber,” says Barbarán, as she enumerates the challenges she and her community face. Such illegal activity undermines not only the local environment but also the local economy, which depends on forests and forest products. Which is why villagers and supporting organizations are always looking for new approaches for conserving the forests and increasing their incomes – including the mechanism known as REDD+. 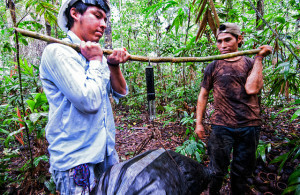 Since 2012, Barbarán’s community has been involved in a REDD+ project led by the non-profit Association for Research and Integral Development (Asociación para la Investigación y el Desarrollo Integral, AIDER). The basic idea of REDD+ is to place a monetary value on the carbon emissions that are saved through avoided deforestation. AIDER runs initiatives in seven regions in Peru, where communities create forest management plans and obtain certification for their timber, as a way of reducing deforestation and generating carbon credits in return. Yet the effectiveness of REDD+ for conservation and livelihoods remains unclear. 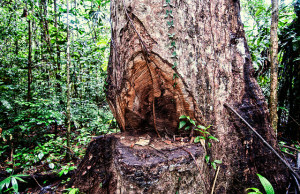 To learn more about its impacts, the Center for International Forestry Research (CIFOR) has been conducting research in the four sites, as well as in four nearby control sites. The research forms part of CIFOR’s six-country Global Comparative Study on REDD+, which looks at a total of 23 such initiatives around the world. Through household questionnaires and community focus groups, villagers explained how they make a living, their access and rights to land, how they manage land and forests, the extent of deforestation, and their involvement in REDD+. The study found that understanding and support for REDD+ varies among communities, according to CIFOR’s Dawn Rodríguez-Ward, who supervised the field research. “Villagers do tend to see REDD+ projects as a long-term avenue for controlling deforestation in the region,” she says. The Shipibo-Konibo communities that live along the banks of the Ucayali River are some 35–120 km from the nearest markets in Pucallpa, with boats as their only form of transport. Their lives revolve around the river and its fluctuations. CIFOR’s research found that they try various means of generating income from their forests and land. “Diversification of their livelihood activities is vital because of the seasonal flooding that drowns crops but brings fish-spawning runs,” says CIFOR field assistant Medardo Miranda. For a few months a year, villagers grow crops such as bananas and cassava. What the families do not eat themselves, they sell to the traders who pass by on wooden boats. Outside of these months, they take advantage of game, fish, crops, timber and other forest products that are available at different times of the year. But selling surplus crops is not very profitable – and so leaders seek alternatives. Carolina Barbarán sees a future in certified timber management and REDD+ as ways to increase community income and, she hopes, curb illegal logging. 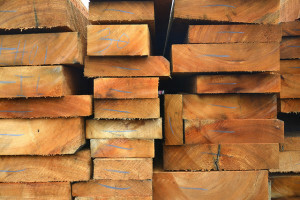 Barbarán says about 50 families in her district of Callería participate in timber management in about 3,800 hectares of forest, with a quota for each family. Yet managing their land brings its own challenges. “Our monitoring committee tries to protect against illegal logging and fishing, but it lacks money for equipment and gasoline, and villagers complain that the task of patrolling takes them away from farming, fishing and other livelihood activities,” Barbarán says. Ultimately, the effectiveness of REDD+ will depend on whether AIDER is able to find buyers for carbon credits, especially among companies in Europe. If successful, that will be the next phase of AIDER’s REDD+ project, says Pío Santiago, AIDER’s coordinator in Ucayali. It remains to be seen whether the communities in the Ucayali River Valley will be able to sell carbon credits, but the REDD+ projects and other activities have helped them think about additional ways of producing an income. “It’s important to reinforce the concept of forest management from an integral standpoint,” Santiago says.